73% of Wolverhampton’s matches had under 2.5 goals in Premier League. Newcastle Utd have scored 42% of their goals in the first 15 minutes in Premier League. Wolverhampton conceded at least 1 goal in each of their last 7 matches in Premier League. Newcastle Utd have scored 75% of their goals in the first half in Premier League. Newcastle Utd conceded at least 1 goal in 88% of their home matches in Premier League. Wolverhampton have scored 33% of their goals after the 75th minute in Premier League. 65% of Newcastle Utd’s conceded goals were conceded at home in Premier League. 80% of Wolverhampton’s goals have been scored in the second half in Premier League. Torino have been undefeated in their last 7 away matches in Serie A. 32% of Sassuolo’s conceded goals occurred in the first 15 minutes in Serie A.
Parma have scored 73% of their goals in the first half in Serie A.
Chievo have failed to win in their last 14 matches in Serie A.
AC Milan conceded at least 1 goal in each of their last 7 home matches in Serie A.
Sassuolo conceded at least 1 goal in 71% of their home matches in Serie A.
Fiorentina have drawn their last 3 away matches in Serie A.
Chievo have scored 36% of their goals after the 75th minute in Serie A. 46% of Fiorentina’s conceded goals occurred after the 75th minute in Serie A.
Chievo have conceded the opening goal in 79% of their matches in Serie A.
Sassuolo have drawn their last 3 home matches in Serie A. 71% of Fiorentina’s matches had under 2.5 goals in Serie A.
AC Milan have scored the opening goal in 71% of their matches in Serie A.
Torino have scored in 71% of their away matches in Serie A. 71% of Levante’s matches had over 2.5 goals scored in La Liga. Eibar have scored in 100% of their home matches in La Liga. Levante have scored in each of their last 5 away matches in La Liga. 79% of Valladolid’s matches had under 2.5 goals in La Liga. 67% of Levante’s conceded goals were conceded at home in La Liga. Eibar conceded at least 1 goal in 71% of their home matches in La Liga. Levante have scored in 86% of their away matches in La Liga. 73% of Valladolid’s goals have been scored in the second half in La Liga. 71% of Real Betis’s goals have been scored in the second half in La Liga. Levante have scored 26% of their goals in the first 15 minutes in La Liga. Real Sociedad have failed to score in 50% of their home matches in La Liga. Valladolid did not concede any goal in 57% of their away matches in La Liga. Levante have scored in each of their last 10 matches in La Liga. 68% of Rayo Vallecano’s conceded goals were conceded at home in La Liga. Levante have been undefeated in their last 4 away matches in La Liga. Rayo Vallecano have conceded the opening goal in 71% of their matches in La Liga. 31% of Moenchengladb.’s conceded goals occurred in the first 15 minutes in Bundesliga. 35% of Stuttgart’s conceded goals occurred after the 75th minute in Bundesliga. 79% of FSV Mainz’s conceded goals occured in the second half in Bundesliga. Hannover 96 conceded at least 1 goal in each of their last 11 matches in Bundesliga. 69% of Hannover 96’s matches had over 2.5 goals scored in Bundesliga. Moenchengladb. have scored 2 goals or more in each of their last 6 home matches in Bundesliga. 32% of Hannover 96’s conceded goals occurred after the 75th minute in Bundesliga. 77% of Moenchengladb.’s matches had over 2.5 goals scored in Bundesliga. Hannover 96 have conceded 2 goals or more in each of their last 6 away matches in Bundesliga. Moenchengladb. have scored in 100% of their home matches in Bundesliga. Hannover 96 conceded at least 1 goal in 100% of their away matches in Bundesliga. Moenchengladb. have won their last 6 home matches in Bundesliga. Strasbourg have scored 40% of their goals after the 75th minute in Ligue 1. Caen have failed to win in their last 8 matches in Ligue 1. Saint-Etienne have been undefeated in their last 8 home matches in Ligue 1. 69% of Marseille’s matches had over 2.5 goals scored in Ligue 1. 81% of Reims’s matches had under 2.5 goals in Ligue 1. Strasbourg conceded at least 1 goal in 88% of their home matches in Ligue 1. Lille have been undefeated in their last 8 home matches in Ligue 1. Reims did not concede any goal in 62% of their away matches in Ligue 1. Marseille have scored 34% of their goals after the 75th minute in Ligue 1. Marseille have scored in 75% of their away matches in Ligue 1. FC Emmen conceded at least 1 goal in 100% of their away matches in Eredivisie. 43% of Feyenoord’s conceded goals occurred after the 75th minute in Eredivisie. VVV have scored 2 goals or more in each of their last 4 home matches in Eredivisie. FC Groningen conceded at least 1 goal in 86% of their home matches in Eredivisie. FC Emmen conceded at least 1 goal in 86% of their home matches in Eredivisie. 75% of FC Emmen’s goals have been scored in the second half in Eredivisie. Feyenoord have won their last 7 home matches in Eredivisie. VVV have scored in 71% of their away matches in Eredivisie. FC Emmen were losing at halftime in 64% of their matches in Eredivisie. Feyenoord have won 100% of their home matches in Eredivisie. VVV have conceded 2 goals or more in each of their last 3 matches in Eredivisie. FC Emmen have scored in 71% of their away matches in Eredivisie. FC Kobenhavn have been undefeated in their last 7 matches in Superligaen. Brondby IF have scored in each of their last 8 away matches in Superligaen. FC Kobenhavn have scored in each of their last 18 matches in Superligaen. 72% of FC Kobenhavn’s matches had over 2.5 goals scored in Superligaen. Vejle BK conceded at least 1 goal in each of their last 8 matches in Superligaen. 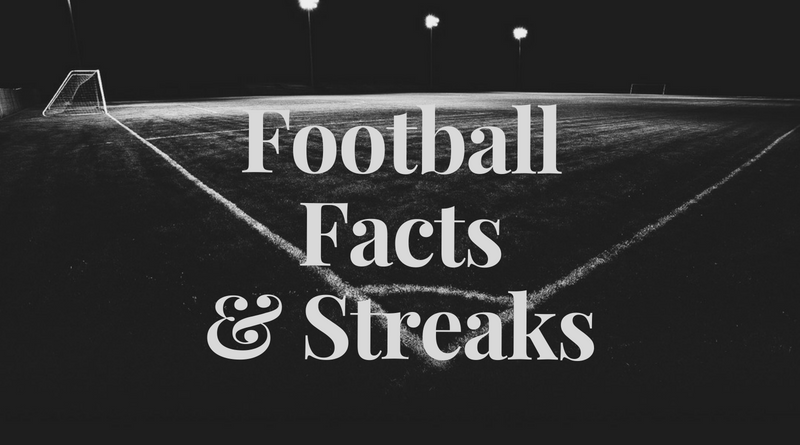 FC Kobenhavn have scored in 100% of their home matches in Superligaen. Vejle BK conceded at least 1 goal in 89% of their home matches in Superligaen. FC Kobenhavn conceded at least 1 goal in 75% of their home matches in Superligaen. 46% of Brondby IF’s conceded goals occurred after the 75th minute in Superligaen. FC Kobenhavn have scored 37% of their goals after the 75th minute in Superligaen. Esbjerg have scored in each of their last 7 matches in Superligaen. FC Kobenhavn have scored 2 goals or more in each of their last 7 home matches in Superligaen. Esbjerg have scored in 89% of their away matches in Superligaen. FC Kobenhavn have won their last 7 home matches in Superligaen. Brondby IF have scored in 100% of their away matches in Superligaen. FC Kobenhavn were leading at halftime in 56% of their matches in Superligaen. Brondby IF have scored 2 goals or more in each of their last 5 away matches in Superligaen. Akhisar Belediy have scored 44% of their goals after the 75th minute in Super Lig. Bursaspor have scored in each of their last 7 matches in Super Lig. Akhisar Belediy have scored in 100% of their home matches in Super Lig. Antalyaspor have scored 65% of their goals in the first half in Super Lig. 71% of Bursaspor’s matches had under 2.5 goals in Super Lig. Akhisar Belediy conceded at least 1 goal in 71% of their home matches in Super Lig. 64% of Bursaspor’s conceded goals occured in the first half in Super Lig. Akhisar Belediy have conceded the opening goal in 71% of their matches in Super Lig.